How to prioritize features is always a hot topic for product teams. Even the most seasoned product manager struggles with determining which features and initiatives to put on the roadmap. With so many opportunities competing for scarce resources, how to decide? Whether you’re developing a new product or maintaining an existing product here are seven different techniques you can use to prioritize product features. In the end, the technique you choose isn’t as important as the conversation your team has about the priorities. And even if you disagree about the specific prioritization, if you can get agreement on the criteria, you’re ahead of the game. 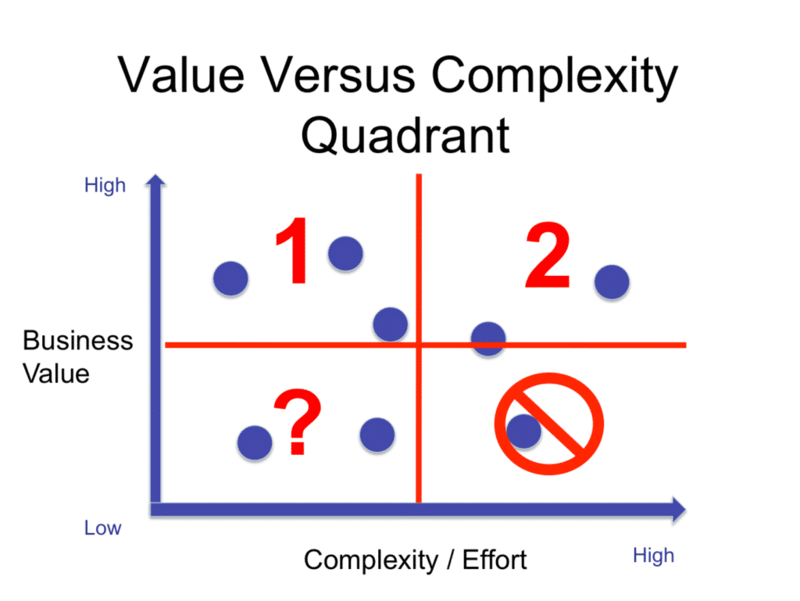 In the Value versus Complexity model you evaluate every opportunity based on its business value and its relative complexity to implement. Based on our conversations with product managers this is a common approach, and many product managers go through this assessment instinctively every day. The matrix is simple: The initiatives that have the highest value and the lowest effort will be the low-hanging fruit for your roadmap. With weighted scoring you can use the Value versus Complexity model, but layer in scoring to arrive at an objective result. Based on dozens of interviews with product managers we arrived at this model for our prioritization model in ProductPlan. By using a scoring method to rank your strategic initiatives and major features, product managers can facilitate a more productive discussion about what to include on the product roadmap. While there are many inputs that ultimately go into a product decision, a scoring model can help the team have an objective conversation. A clear, objective scoring model can inform the initiatives you decide to include on your roadmap, and lend credibility to your product strategy. In ProductPlan, you can seamlessly drag approved initiatives from the Planning Board onto your roadmap. With the Kano model product managers can look at potential features through the lens of the delight a feature provides customers versus the potential investment you make to improve the feature. There are some basic features that your product simply needs to have in order for you to sell your product in the market. You need to have these “threshold” features, but continuing to invest in them won’t improve customer delight dramatically. There are some features (like performance) that give you a proportionate increase in customer satisfaction as you invest in them. Finally, there are some “excitement” features that you can invest in that will yield a disproportionate increase in customer delight. If you don’t have these features, customers might not even miss them; but if you include them, and continue to invest in them you will create dramatic customer delight. This is an activity you can use with customers or stakeholders to prioritize a set of potential features. The approach is simple but fun. List out potential features and assign a “price” to each (based on a relative cost to develop it). Hand out a set amount of cash and then ask participants to buy the features. Some will place all their money on one particular feature they’re passionate about, while others might spread their cash around the room. The result is your prioritized feature list. Opportunity scoring is a type of Gap Analysis that comes from Outcome-Driven Innovation. Without getting too detailed, the idea is to measure and rank opportunities based on their importance versus customer satisfaction. To conduct opportunity scoring you ask customers to score the importance of each feature and then also score how satisfied they are currently with that feature. Your opportunities are those features that are highly important yet customers gave a low satisfaction score. Affinity grouping can be a fun prioritization activity. I’ve conducted affinity grouping sessions with product teams that are trying to understand what to build. The idea is simple: have everyone brainstorm opportunities on sticky notes. Then as a team, begin to group similar items together, and then name the groups. Finally, everyone on the team begins to vote on or rank the groups. Story mapping is a personal favorite of mine, and is a great way to document the MVP by organizing and prioritizing user stories. The idea in a nutshell is that you first create task-oriented story cards and group them into a workflow. You then arrange the cards in priority order for each group. The final step is to draw a line (often with tape) across all the stories to divide them into releases/sprints. I’m oversimplifying, so there are lot of great resources to learn more, including articles and presentations. Approach prioritization as a team activity; not only is does it create buy-in on the team, you get different perspectives. It’s also a lot more fun. Limit the number of items you are prioritizing – focus on the biggest items rather than the details. Categorize and group initiatives together into strategic themes (for example, “improving satisfaction” for a particular persona would be a good way to group). Before you begin prioritizing, it’s helpful if you understand the customer value for each initiative. The customer value should be rooted in evidence that you’ve gathered from customers rather than your opinions. Before you begin, have a rough estimate of cost. Even T-shirt sizing of “small” “medium” and “large” will be helpful during the process. If your interested in learning more about how to prioritize product features for your product roadmap, check out our free eBook: Product Roadmaps: Your Guide to Planning and Selling Your Strategy. I would also work in “Cost of Delay” — what is the penalty for not doing this feature? It may otherwise score as a low priority but if the CoD is high, it moves up proportionately.